The former interim DNC chair makes the admission in an essay for Time magazine. camera (Paul J. Richards/AFP/Getty Images) Democratic National Committee Chair Donna Brazile, right, confers with US Senate Minority Leader Harry Reid, D-Nevada, prior to the third and final US presidential debate between Hillary Clinton and Donald Trump on October 19, 2016. Former interim Democratic National Committee chairperson Donna Brazile has for months been dodging questions about passing along potential topics to Hillary Clinton's staff in advance of a CNN town hall -- but now, she's speaking out and calling the misstep "a mistake I will forever regret." Emails from Clinton campaign Chair John Podesta's account were released in October by WikiLeaks showing that the then-CNN contributor had forwarded potential topics ahead of a town hall last spring. 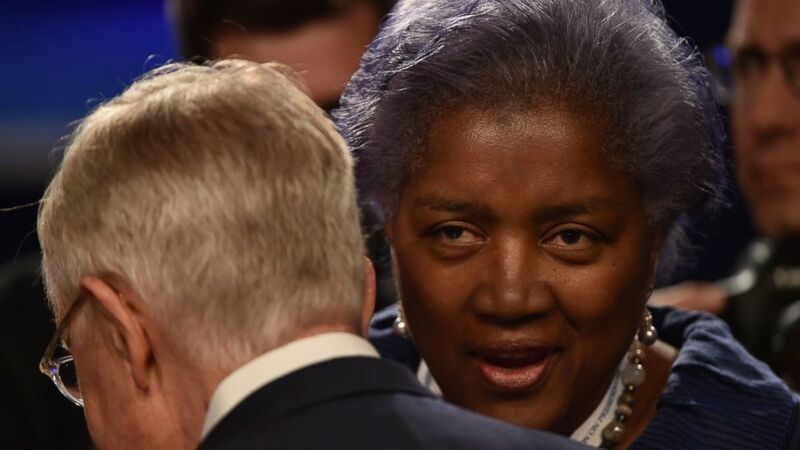 In an essay Brazile wrote for Time magazine, published Friday, the Democratic strategist, who's been an ABC News contributor, charts the DNC's rocky period, writing, "When I was asked last July to step in temporarily as D.N.C. Chair, I knew things were amiss. The D.N.C. had been hacked, and thousands of staff emails and documents were plastered on various websites. Staff were harassed, morale suffered, and we lost weeks of planning. Donors were harassed, and fundraising fell off." She then addresses the release of Podesta's emails, writing, "Then in October, a subsequent release of emails revealed that among the many things I did in my role as a Democratic operative and D.N.C. Vice Chair prior to assuming the interim D.N.C. Chair position was to share potential town hall topics with the Clinton campaign. I had been working behind the scenes to add more town hall events and debates to the primary calendar, and I helped ensure those events included diverse moderators and addressed topics vital to minority communities." She further explains, "My job was to make all our Democratic candidates look good, and I worked closely with both campaigns to make that happen. But sending those emails was a mistake I will forever regret." Brazile says the media's narrative of the scandal was precisely what Russia was aiming for. "By stealing all the DNC's emails and then selectively releasing those few, the Russians made it look like I was in the tank for Secretary Clinton," she writes. "Despite the strong, public support I received from top Sanders campaign aides in the wake of those leaks, the media narrative played out just as the Russians had hoped, leaving Sanders supporters understandably angry and sowing division in our ranks." She continues, "In reality, not only was I not playing favorites, the more competitive and heated the primary got, the harder D.N.C. staff worked to be scrupulously fair and beyond reproach. In all the months the Russians monitored the D.N.C. 's email, they found just a handful of inappropriate emails, with no sign of anyone taking action to disadvantage the Sanders campaign."